Yes, these chocolate truffles are decadent and luxurious but they’re also simple to put together and they will wow a party or an intimate dinner for two. INT. MATT AND EMILY’S LIVING ROOM. 2PM, VALENTINE’S DAY. Fast-paced close-up montage of: Fastening crampons. Pulling on ski mask. Adjusting gloves. Snapping on protective goggles. EMILY: This is madness! You’re never going to make it! MATT (CONT’D): (Quietly) I have to at least try. MATT (CONT’D): Are you insane? It’s crazy out there! Isn’t there anything we can make with just chocolate, butter and eggs? EMILY: (Also looks out window, into the middle distance) Yes. Yes there is. Honestly, I feel like you’re not going to believe me when I tell you how easy these are to make. We whipped them up in about 20 minutes and they were chilled and ready by episode 2 of our “House of Cards” marathon. We used this chocolate truffles recipe from Food52 and added just a touch of vanilla and a smidge more salt. We also ended up using a bit of a grab bag of chocolate bits and bobs leftover from other recipes (some bittersweet chips, part of a dark bar, a few semisweet pastilles). The result was wonderfully dark, with just the right hint of sweetness, but you should use whatever chocolate you like best). They really do have a wonderful ultra-smooth, silky texture and you don’t even have to roll them into balls (of course, you can if you want). I love how modern they look as perfect, little bite-sized squares. This method heats the egg yolks to a 160 degrees so they are safe for all to enjoy. If you want to make balls, use a vey small ice cream scoop or a tablespoon and then roll them in your hands. Store the chocolate truffles, tightly covered, in the refrigerator for up to 2 weeks, or in the freezer for up to 3 months. Put the egg yolks in a small heatproof bowl, and set the bowl over a saucepan of very hot (but not boiling) water to heat the egg yolks until barely lukewarm. Set aside. 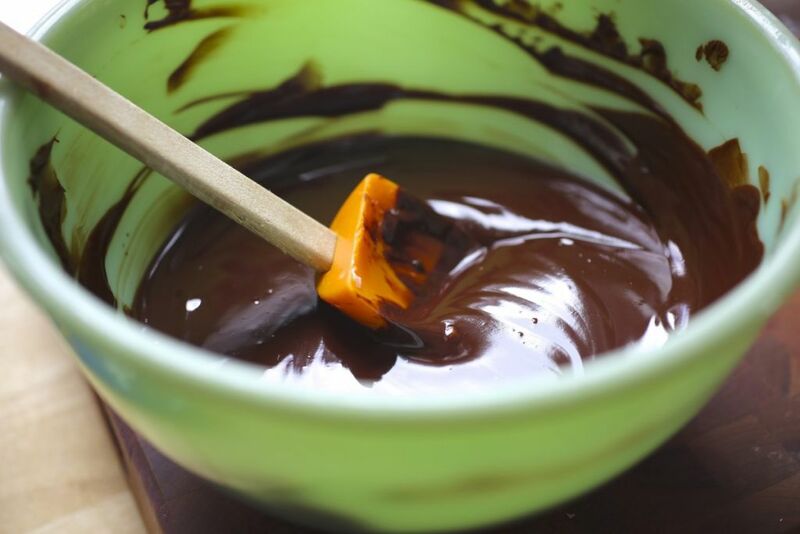 Meanwhile, put the chocolate, butter, and salt in a medium heatproof bowl, and set the bowl over the same saucepan of hot water and stir frequently until the chocolate and butter are melted and the mixture is smooth and quite warm. (If you have an instant-read thermometer, the temperature should be between 120° and 130°F.) Scrape the mixture into the food processor and set the strainer over the processor bowl. Bring ½ cup water to a boil in a very small saucepan or in a glass measure in the microwave. Pour the boiling water steadily into the egg yolks, stirring constantly with a silicone spatula. (When the yolks and water are blended, the temperature should be at least 160°F to be fully food safe). Pour the mixture through the strainer into the food processor. Tap the strainer against the bowl to encourage all of the liquid to flow through, but don’t press on any bits of cooked egg in the strainer. Add the vanilla to the mixture. Process the mixture for a few seconds, then scrape the bowl and process again for 20 or 30 seconds, or as long as it takes for the mixture to thicken and resemble satiny-smooth chocolate pudding. Scrape the mixture into the lined pan and spread it evenly. Let cool, then cover and refrigerate until firm, at least a few hours. To shape the truffles: Put half of the cocoa in a small bowl. Remove the baking pan from the refrigerator and use the liner to remove the truffle sheet. Invert it on a cutting board and peel off the liner. 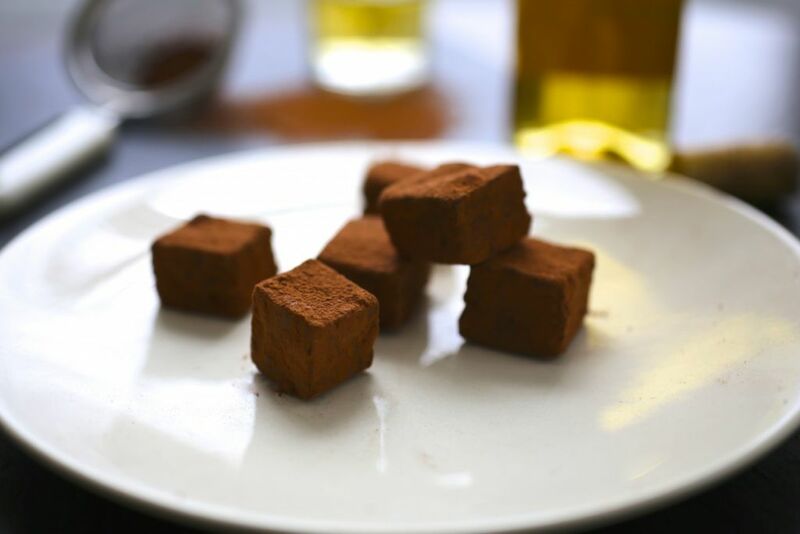 Cut the truffles into 1-inch squares (or smaller, if you prefer) and toss them in the cocoa powder, adding more cocoa as necessary. 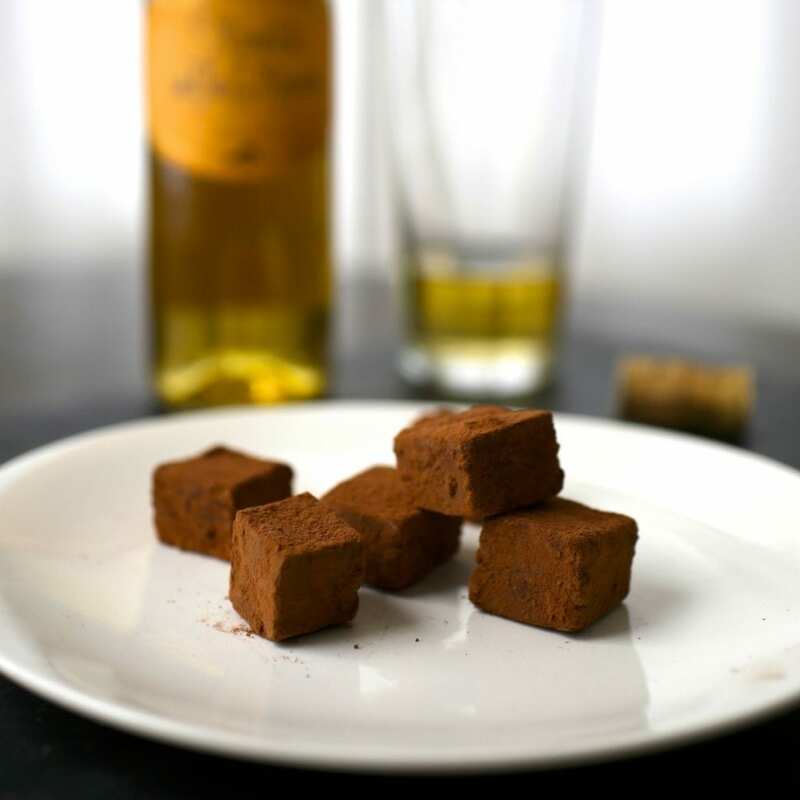 You can leave the truffles square or dust your hands with cocoa and roll them into balls. Shake the truffles gently in a coarse strainer to remove excess cocoa. 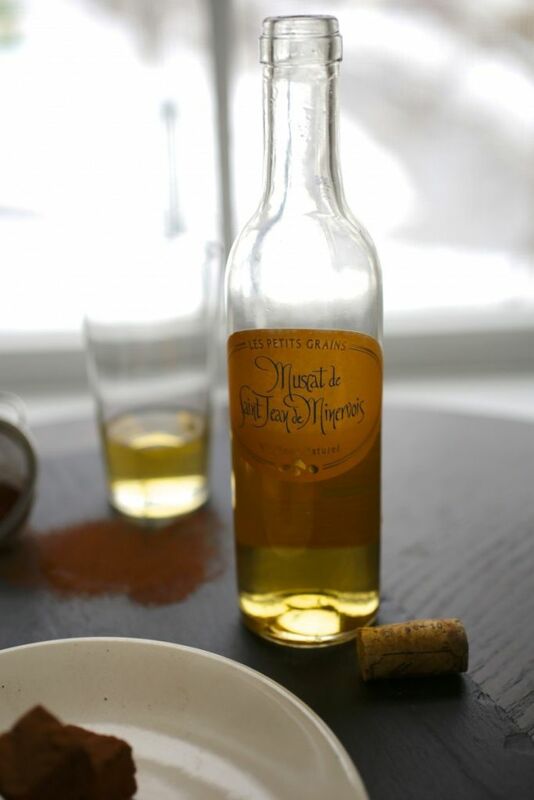 Remove the truffles from the refrigerator about 15 minutes before serving. Sift a little extra cocoa over them as necessary. Luscious…a must-try for a dark chocolate lover like me.